I think it is clear that there should be a way to dismiss certain validation errors from being reported. When something is dismissed, it would then not show up again. For example, if a theme uses an illegal overflow CSS property, then this is going to get reported on every URL. But if it doesn't cause a big problem for the AMP rendering the page, then this is something the user probably would like to ignore. If you have a plugin that does one thing you know is bad, and the removal doesn't cause any problems in AMP, then the user should be able to just acknowledge it was removed and cease getting notified about it. If you had 100 posts and each had a different script tag, you want to understand what's unique. There should be a count of unique instances of the post so you can know what is unique so you can prioritize what should be fixed. There should be the ability to suppress errors for not valid AMP so you don't get reported ("deal with it later") - sanitizer will take care of it anyway to ensure validity. 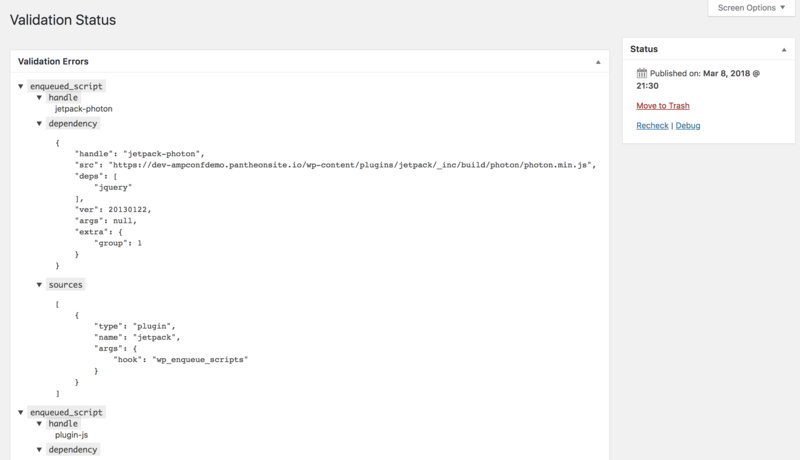 Validation errors exist now for a given URL and issues will be grouped together in the same post. if you had 100 posts and each had a different script tag, you want to understand what's unique. have a count of unique instances of the post so you can know what is unique so you can priortize what should be fixed. 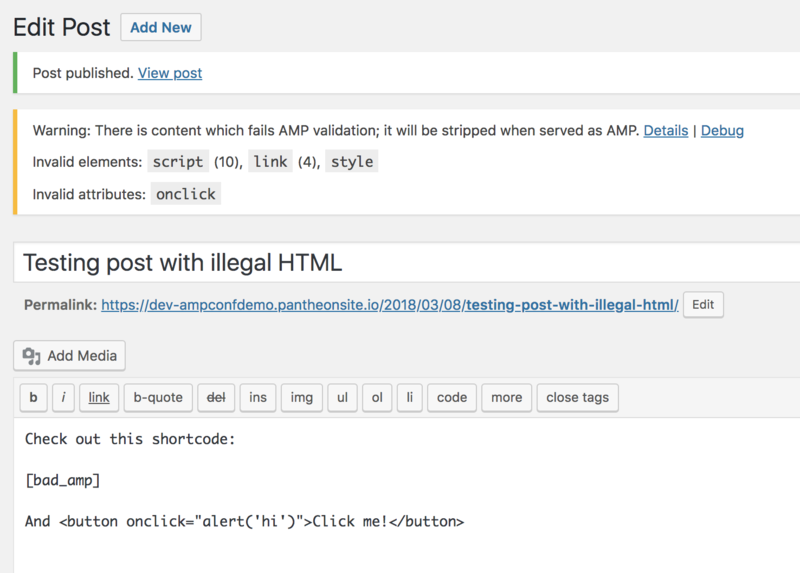 Ability to suppress errors for not valid AMP so you don't get reported ("deal with it later") - santizer can take care of it anyway. Let me know if there's any details here I'm missing. Related #1006, which should inform/be informed by progress in both places. Yeah, I think this needs some UX insights to figure out what would be the most beneficial for users. It's closely related to my #1060 (comment) and the story of activating AMP on a site. It could go so far as a “wizard”-like setup flow. But beyond the initial setup, there is then the ongoing monitoring of validity, as new content is added and plugins are added/removed. In addition to a user being able to acknowledge a validation error to ignore/suppress it, the user should also be able to acknowledge a validation error as being critical. Critical and unacknowledged validation errors should prevent a response from being served as AMP at all, whereas if only ignored/suppressed errors are present then AMP can be served. Acknowledging a validation error marks it as read so that the user is not notified about it. Essentially a validation error needs to have a status introduced. Hey @westonruter, thank you for all of your suggestions and definitions here. I think a nice flow for end-users to enable AMP theme support without doing coding. Related to a lot of the documentation work that @kienstra has done, I think it's something we should consider continue doing to help non-developer admins be able to get a seamless AMP experience. This is a big part of the narrative we're trying to create: We've made (and are continue to make) AMP as easy as possible to use, and are extending features. Perhaps we can extend the work here and make a "Getting started for non-coding admins" guide? Let me know your thoughts. @postphotos Yes, I think there would need to be a guide that explains what things might need to be re-worked when enabling AMP. But I should think that most of that information would ideally be presented contextually as the user is taken throw some flow for enabling AMP for a given theme. You'll see a notice: "There is content which fails AMP validation. Non-accepted validation errors prevent AMP from being served. Review issues"
At the top of both errors, you should see a <select> element with "New," "Accepted" and "Rejected"
Expected: If you select "Accepted" for all of the errors, this appears: "This URL can be served as AMP because all validation errors have been accepted as not being blockers."